Charming memoir of renowned western novelist Kelton’s (Texas Showdown, not reviewed) early years in the saddle, at the desk and in the trench. The author’s querencia—the word means something like the place where a person is most at home—is at the edge of the Chihuahuan Desert, “a ranch in Crane and Upton counties, just east of the Pecos River.” Kelton, born in 1926, found his life work not only as a novelist of daily life in the rural West (“My characters,” he writes, “are five-eight and nervous”) but also as an agricultural journalist of high standing. To arrive there, as he relates, he had to live the tough life of the cowhand, his parents bound by inclination and custom to a part of the country that could be unforgiving and ungenerous for years at a time, but then surprise with a bountiful harvest. His father was part of the “last full-time horseback cowboy generation,” and if he himself learned how to get around on a horse and throw a lasso, Kelton (and his father) soon recognized that he was better suited to something other than cowboying. With another querencia in books such as Alice in Wonderland, The Wizard of Oz and the collected works of Zane Grey, Kelton came of age aspiring to be a writer—and found his Depression-scarred father wholly in support, if a little worried about how the boy would make a living. 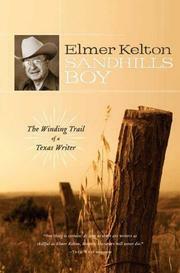 Kelton’s memoir then moves in rapid succession from ranch to university, and just as quickly into combat, describing his service as a foot soldier during World War II and courtship of a young Austrian widow whom he would take home to Texas, to considerable culture shock on both sides. “The word ‘cowboy’ has taken on negative connotations in recent times,” writes Kelton wryly, “especially in a political or military context.” This memoir helps restore what to westerners is an honorable term, and it’s a pleasure through and through.